We’ll have to wait til April for it, but judging by the “Look Inside” available on Amazon, The Ultimate Cartoon Book of Book Cartoons will be well worth the wait. Published by Princeton Architectural Press, the anthology was edited by New Yorker cartoonist, Bob Eckstein. Mr. Eckstein has packed the pages with New Yorker contributors such as Sam Gross (whose drawing graces the cover), Danny Shanahan, Liza Donnelly, Peter Steiner, Roz Chast, Arnie Levin, George Booth, David Borchart, Ed Steed, John O’Brien, and many more (the full list is below). If you love cartoons, books and bookstores, this is most definitely the collection for you. Marisa Acocella, George Booth, David Borchart, Pat Byrnes, Roz Chast, Frank Cotham, Liza Donnelly, Nick Downes, Bob Eckstein, Liana Finck, Alex Gregory, Sam Gross, William Haefeli, Sid Harris, Bruce Eric Kaplan, Robert Leighton, Arnie Levin, Bob Mankoff, Michael Maslin, Paul Noth, John O’Brien, Danny Shanahan, Michael Shaw, Barbara Smaller, Ed Steed, Peter Steiner, Mick Stevens, Julia Suits, P.C. Vey, Kim Warp, Christopher Weyant, Jack Ziegler. And now we’re into the second double issue of the summer. Sure does make the season seem to fly by. When the next new issue appears it will be mid-August, when kids begin gathering their back-to-school supplies. Having spent many summers at the (New) Jersey shore I found Tom Gauld’s somewhat cinematic cover an excellent piece of work. And speaking of the Jersey shore, it was fun encountering John O’Brien‘s cartoon in the issue (although the subject matter has nothing to do with the beach scene). Mr. O’Brien was a decades-long life guard in Wildwood, New Jersey. Fourteen cartoons in this double issue (none full page), and nineteen illustrations (four of them full page). Just sayin’. Liana Finck’s Alice in Responsibilityland (great title). Much enjoyed roaming around Alice’s kitchen. Ed Steed’s drawing: a big-game hunter scenario. The first split-second impression — upon seeing the drawing on my tablet — was that the mounted objects on the wall were things that were placed so high and out of reach on grocery store shelves that they required one of those grabbing devices to get hold of them. Seeing the cartoon later on in the digital edition it’s clear the mounted objects are trash. Joe Dator’s chicken or egg drawing. What a treat. You’ll note that Jason Chatfield shares credit with Scott Dooley. Still somewhat a rarity to see a cartoon co-credited. Check out Messrs. Chatfield & Dooley’s podcast, Is There Something In This? Elsewhere in the issue, I note, as I have in every Monday Tilley Watch since May of 2017, that Rea Irvin’s classic Talk of The Town masthead is still absent. If you want to read more, go here. I don’t know about you, but after I’ve looked through the cartoons of each new issue of The New Yorker I have the kind of immediate reaction I have after sitting through a movie. As I begin walking up the aisle, the verdict is usually already in: good movie, bad movie, loved it, hated it, so-so, etc.. I looked through this latest issue of the magazine and thought: good cartoons. Good cartoons from beginning to end, with a real gem mid-way through. The first cartoon of the issue, William Haefeli’s on page 18 gets things going. Haefeli’s drawings never disappoint, and in this case caption and drawing are doing exactly what I hope for in every New Yorker cartoon (giving us Peter Arno’s one-two punch; in this case the one-two are so close together it’s a onetwo punch) If you have the issue in front of you (print or digital) notice the child’s body language. Mr. Haefeli has created a drawing that almost moves. Three pages later a drawing by Amy Hwang, who has become somewhat of a cat specialist. 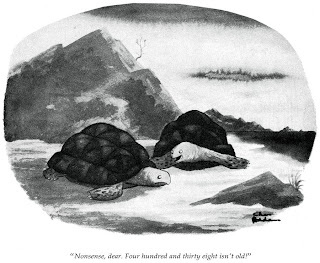 This is a lovely drawing, with a terrific caption. I predict it’s going to be reprinted on a lot coffee mugs and t-shirts. Five pages later a curio: a P. C. Vey Christmassy drawing in the January 15th issue. It’s a very good drawing replete with tree and one very large gift. I’ll forever wonder why it wasn’t in the issue of December 18 or the issue just after, January 1, 2018. A mystery! Another five pages brings us to a Kim Warp drawing employing two of my favorite subjects: dinosaurs and space travel (in this case time/space travel). Another wonderful drawing with a really good caption. Six pages later, the gem I spoke of earlier. John O’Brien gives us a site (a work site) to behold — it’s caption-less too (to me, caption-less cartoons are the most difficult to successfully achieve. Mr. O’Brien’s batting average of success with them is crazy high). This is a high bar New Yorker drawing. And so: applause, applause. On the very next page is a Matt Diffee cartoon. He, like a few other cartoonists in the magazine use a box to frame their work (Jack Ziegler was King of the New Yorker boxed drawings). Mr. Diffee’s drawings are always easy on the eyes (the soft greys). Here we have a couple of folks ice fishing. The idea centers on the use of the ice machine known as a Zamboni blended with the popular urban food truck. As sometimes happens with drawings, I paused to consider an element (last week it was missing tent stakes). Unfortunately, this pause never fails to get in the way of the one-two punch. Why, I thought, would a Zamboni be on an ice fishing lake? I looked up Zambonis, and learned they are sometimes used on ice skating lakes. But there’s no sign of skaters anywhere on Mr. Diffee’s lake. Perhaps they’re just off to the side, out of the box. I’m fairly certain my fascination with cartoon details such as this comes out of my early cartoon education by way of New Yorker art editor, Lee Lorenz. He once returned a drawing to me and asked if I’d make the surf board in the drawing look less like a six foot cigar. It wasn’t the most important element in the drawing, but if it appeared to be a giant cigar it would take the reader too much out of the drawing. I guess that stuck with me — and now you’re stuck with me pointing out cartoon minutiae. Four pages later, a Will McPhail nearly deserted beach scene. I like the caption. Mr. McPhail shows us one of those funny umbrella tables you see in movies of places that resemble wherever this is. What’s missing is only someone (or something) off in the distance splashing in the ocean. What can I say — I like graphic splashing. Three pages later, a color drawing from Seth Fleishman in a setting far far away from Mr. McPhail’s. Subway rats playing a game. Having just seen a photo in the Times the other day of a NYC rat dragging a moon pie, I’m wondering if NYC subway rats are now a thing. I guess they’ve always been a thing, if you think about it. On the page after the rats is a Roz Chast package drawing. Ms. Chast excels at these, and this one’s right up there, laughs-wise. I haven’t examined a package of Junior Mints in a long time (not my theater go-to candy) but I do wonder if those boxes show the “Juniors” as human…probably not. Six pages later a Brendan Loper Evel Knievel inspired drawing. We don’t see enough dare- devil drawings in the magazine. Interesting drawing. Good stuff. Thirteen pages later, the last drawing in the issue (not counting the Caption Contest pieces): Julia Suits provides a trope that seems to be off-again on-again in the magazine: the military officer pointing out a medal. By off-again on-again I mean we don’t see many for awhile and then they suddenly pop up like asparagus. Henry Martin did a number of these, as did a number of other colleagues. I can’t recall ever doing one. Time to get crackin’. Strange to think of Peter Arno, whose work seems so very much alive, as born 114 years ago. All the years I worked on his biography, from 1999 through 2016, he seemed somehow on the scene, at least the New Yorker scene. In early 2016, with the book wrapping up, I paid one last Arno research visit to Yale, where he spent one year, the Fall of 1922- Spring of 1923. I went there to look for possible Arno materials in a box of Thurber’s papers; it turned out to be a fun but wild goose chase. Even though Arno only attended classes the one year (his father pulled the plug, financially) it was a launch pad year for his not-too-far-off entree to The New Yorker. At Yale his cartoons became quite polished as they appeared more and more in the Record (Arno did a few covers too). Besides drawing, Arno was fully engaged with his other love, music. That last day I spent at Yale I took a walk along York Avenue, with the Bull Dog’s address in hand. I came to the corner of Elm and York and could see some old buildings were right where I needed them to be, diagonally across the street. Crossing Elm I quickly spotted #264 over one of two arched doorways on a three-story Victorian era building. The building had survived (!) but there was some kind of construction going on, with the front partially shrouded, and a dumpster parked out front. The entrance to the Grille (it was upstairs on the third floor) was the door to the right, just behind the plywood wall behind the lone tree. I stood across the street for a bit, then crossed over to see what I could see close-up. It was a wonderful moment thinking about the college-aged Arno heading through that door. I’d read in Dorothy Ducas’s great Arno piece in the March 1938 issue of Mademoiselle that besides playing music upstairs Arno also drew on the walls (ala Thurber!). Standing in front of the building that day there was a lot to imagine. Before writing today’s piece I thought I’d use Google to see what had been done to the place a year or so later. Turns out it wasn’t construction after all — it was destruction. Though the building is gone, those Arno moments playing music and drawing upstairs at the Bull Dog are not entirely forgotten. Also not forgotten: the body of work Arno published in the New Yorker during his 43 years there, much of which can be found in the books below. ps: Rea Irvin’s classic Talk masthead (shown below) still missing from the magazine. Hope it returns soon.